When choosing the correct diameter for your piping system, remember that a larger size does increase air flow. However, a larger diameter will drive the cost of the system up. Size your air system for the tools you will use, the compressor horsepower and the size of your building layout. The thread size of the port on your air compressor tank does not determine the pipe size for your piping system. It is calculated with the length of your piping (building size) and air compressor cfm output. Even though the port on your tank may be small, the air is only traveling through a short distance, so the restriction is minimal. Air is only restricted over a long distance with small piping. For recommendations on system choices and building sizes, please see our CHOOSE A SYSTEM page. 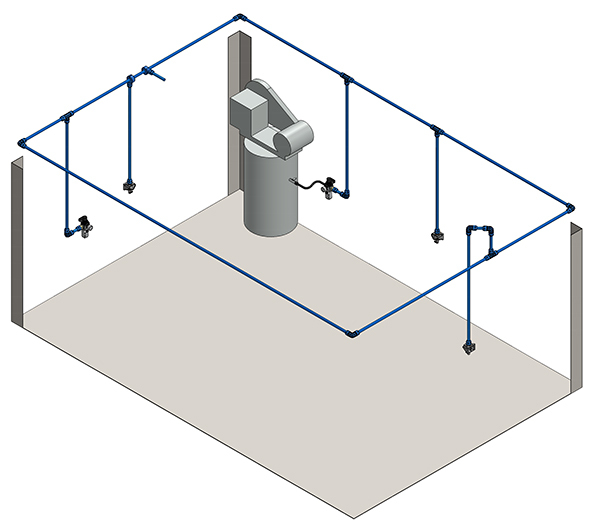 To maximize the flow rate for any of our piping systems, it is best to install your system as a loop. Starting at the air compressor and looping around your shop back to the compressor. This will increase flow rate, decrease pressure drop, and allow smaller line size to be used.